Cable protection manufactured by Centriforce provides a comprehensive range of underground LV, MV & HV electric cable protection solutions which includes heavy duty plastic Stokbord covers and Tapetile tapes for LV-HV cables. Easy to install into cable trenches for protecting 11kV/33kV power cables according to local utility recommendations. Stokbord cable covers and Tapetile cable warning tapes offer clear visual warning and excellent cable impact protection for 11kV-33kV high voltage cables including EHV circuits operating at 66kV, 132kV up to 400kV. The safest and most viable method of underground cable protection against third party digging and excavation cable strikes causing power outages to medium/high voltage cables. 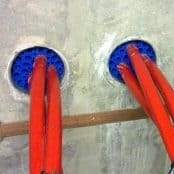 Cable Covers – typically used to protect 11kV to 33kV power cables buried in underground cable trench. Thorne & Derrick provide competitive prices and fast delivery from stock for the complete range of Centriforce cable protection.